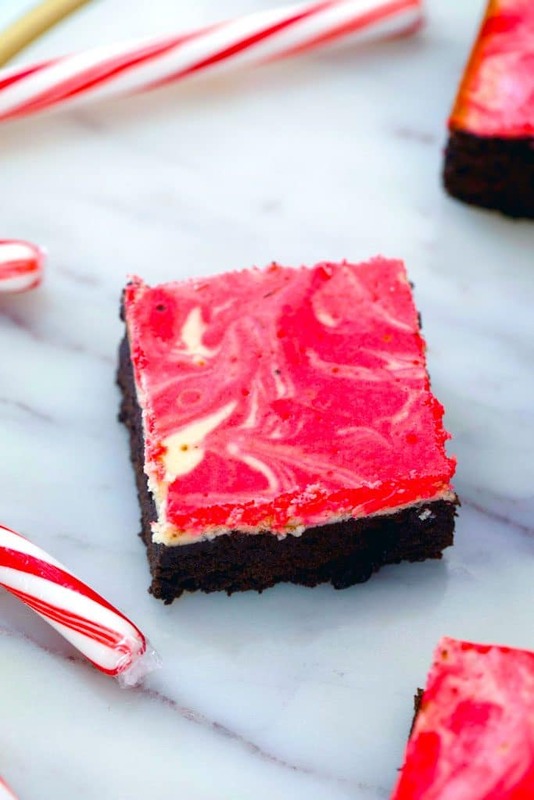 These Peppermint Cheesecake Brownies are packed with festive peppermint flavor with a dreamy red and white swirl, making them the perfect holiday party dessert. 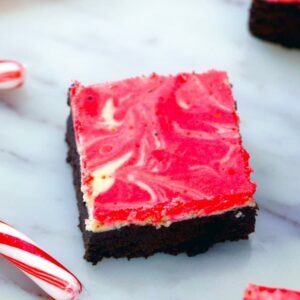 (This recipe for Peppermint Cheesecake Brownies was originally posted in December 2008, but was updated with new photos in 2018). There’s nothing quite like peppermint for the holidays! But once you become an adult, do you really want to eat candy canes? I can’t even remember the last time I actually ate a candy cane and generally just use them for decoration. But I LOVE peppermint… Especially when combined with chocolate. So, when I saw this recipe for Peppermint Cheesecake Brownies in Cooking Light, I knew they had to be made. Because the only thing better than peppermint and chocolate is peppermint, chocolate, AND cheesecake. Holy moly. We can just think of them as candy canes for adults. I was super happy with how these brownies turned out and while they’re far from being healthy, a few Cooking Light recipe tweaks make them slightly not as bad for you. Happy holidays to that! They’re also pretty easy to make and great for bringing to holiday parties. In the original recipe, the cheesecake is left white and is swirled with the chocolate brownie batter. But I decided to color half the cheesecake batter red and swirl it with the white batter, leaving the chocolate brownie batter untouched. 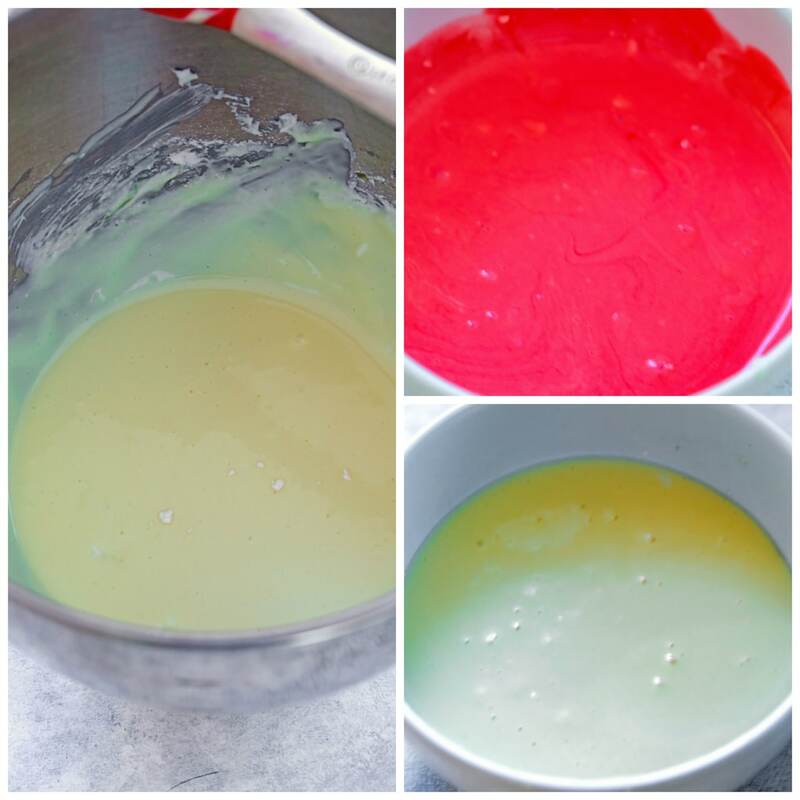 After making the cheesecake batter, I simply separated it into two bowls and colored one a pinky-red. After making the cheesecake batter, I made the brownie batter, which is made extra delicious with the addition of buttermilk. Then I poured the brownie batter into a 9×9 pan, poured the white cheesecake batter over that and dotted the red cheesecake batter around, swirling as I went. If you’re not interested in the red and white look, you can leave all the cheesecake batter white and when you pour your brownie batter into the pan, reserve 1/2 cup. Pour the cheesecake batter over the top and dot that with the reserved brownie batter, swirling as you go. 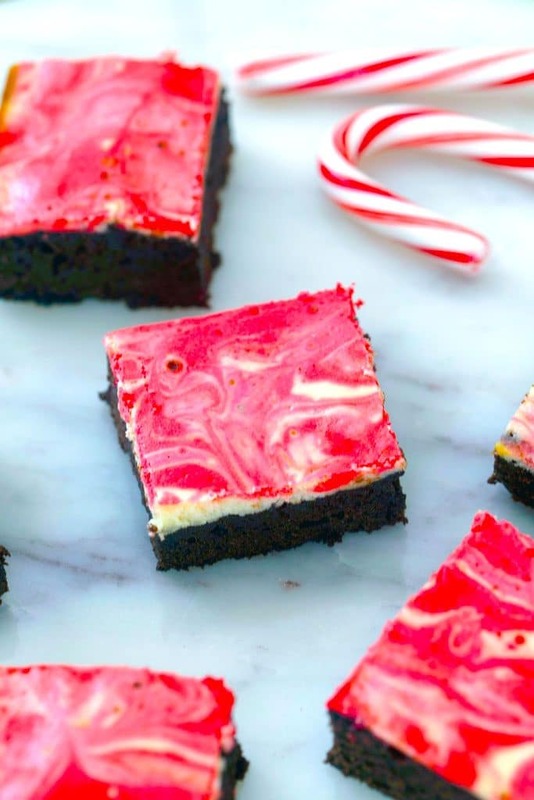 Either way, the peppermint cheesecake brownies are super fun looking and festive for the holidays! Obviously these are still brownies and I would never call them healthy or “light,” but as far as brownies go, they’re not so bad for you. The light cream cheese helps as do some of the lighter ingredients in the brownie base. So, they’re lighter.. But if you bring them with you to a holiday party, nobody will ever know!! Because they’re deliciously rich and chocolatey and packed with peppermint flavor. 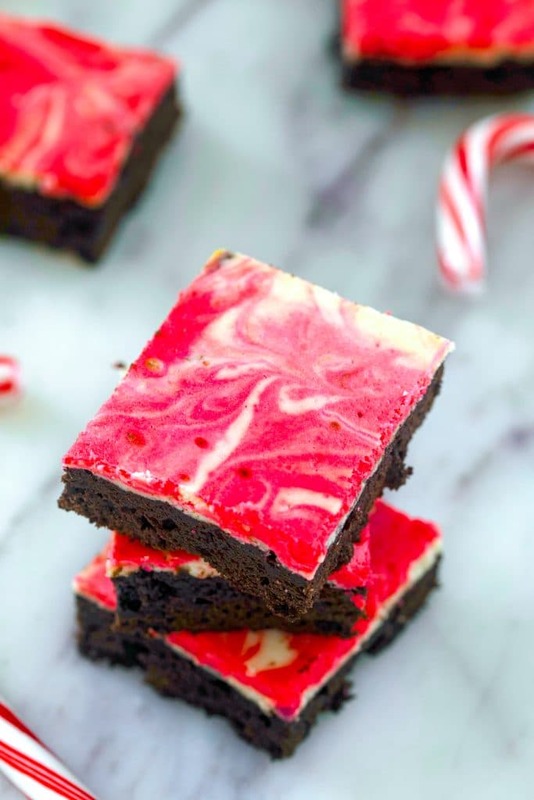 Ooh and I have a pro tip for you… yes these peppermint cheesecake brownies are technically a Christmas dessert, you could easily change the flavors and colors to suit any holiday! Use some pumpkin spice in the cheesecake and dye it orange. Divide the cheesecake batter in three, keeping one batch white, one red, and one blue and flavor some of it strawberry and some of it blueberry for the fourth of July. The options really are endless! You could change the brownie base to a blondie base if you want a lighter bottom. But for now, I’m going to gobble up this batch of peppermint cheesecake brownies and then bake another batch for all the upcoming holiday parties in my life. Let the holiday baking, eating, and partying continue!! And maybe we can work on some of the exercises included in Cooking Light magazine after the holidays. What’s your favorite dessert to bring to holiday parties? If you’re looking for more desserts perfect for holiday parties, check out my Gingerbread Shortbread Cookies or my Coconut Candy Cane Truffles. Pre-heat oven to 350 degrees and lightly spray a 9x9 pan with cooking spray. Put cream cheese in the bowl of a stand mixer or in a large bowl with a hand mixer and beat it at medium speed for about 2 minutes, until smooth. Add granulated sugar and peppermint extract and beat together until well combined. Add the whole egg and the 1 egg white and beat well. Add flour and beat until just combined. Divide cream cheese batter into two bowls. Leave on bowl as is and stir in a few drops of red food coloring to the other bowl, until mixture reaches the shade of pink or red you desire. 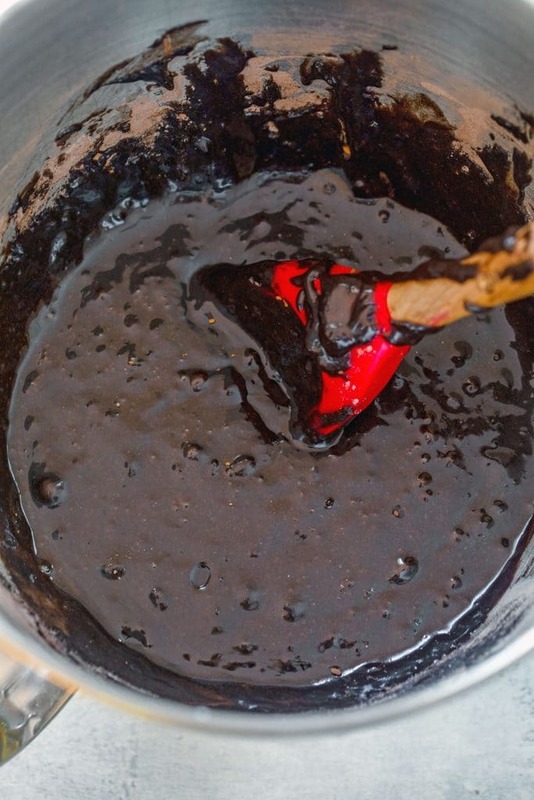 For brownie batter, whisk together flour, cocoa powder, and salt in a medium bowl. In the bowl of a stand mixer or in a large bowl with a hand mixer, combine brown sugar, oil, buttermilk, vanilla, whole egg, and 2 egg whites and beat until just blended. Pour brownie batter into prepared pan. Pour white cream cheese mixture on top of the brownie batter, spreading to the edges. 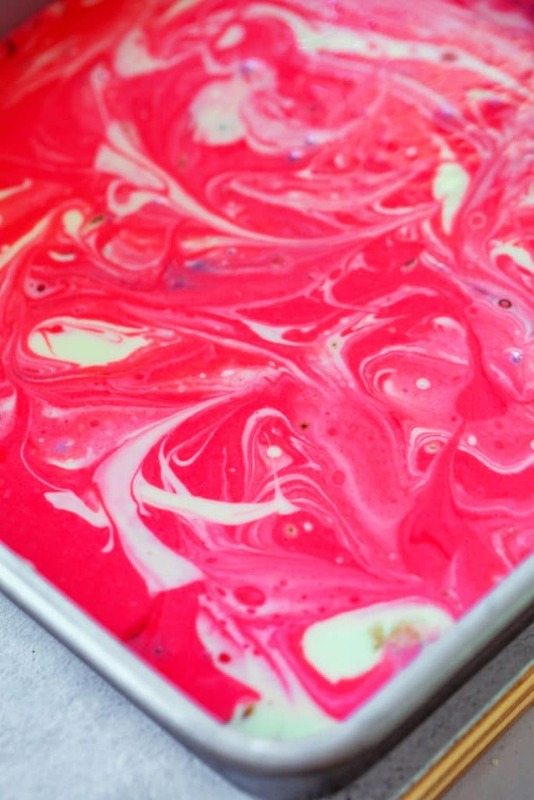 Dot the red batter over the top and gently swirl with the white using the tip of a knife. Bake for 25-27 minutes, until the cheesecake topping is set. Cool in pan on a wire rack before slicing into squares. Note: If you don't want to use red food coloring, you can leave the cheesecake batter white. When pouring your brownie batter into the pan, reserve 1/2 cup. After pouring cheesecake batter over brownie batter, dot with reserved brownie batter and swirl the two layers together. 22 Responses to "Peppermint Cheesecake Brownies"
Those look so good! I think I’m going to make them for XMAS! One question though…what is unsweetened flour? I never knew there was such a thing! how adorable! i love the swirl. don’t you hate it when cooking light tricks you into making a not-so-healthy dessert? these look worth it, though. they sound so tasty 🙂 hope everyone enjoyed them at your gatherings! OMG, these sound amazing! I have a bunch of holiday parties next weekend and I think I’ll be making up some of these goodies to take along! Thanks for the recipe! YUM! look at that swirled beauty. cant wait to try these holiday brownies! So festive!! And I am sure they are beyond tasty! Just let me know where to send you my address. Otherwise it’s going to be awfully difficult for you to mail me the next batch of these. Um yum, I love peppermint. Can’t wait to try! That looks gorgeous! I’m going to need to try it out! Great find in Cooking Light. I can’t believe the great pink color! WOW – those sound absolutely delicious and they look so festive!! Hmph – I bet these were just perfect – they look great! Sara- I hope you ate the ones I left with you!! Heather- YES. Cooking Light sounds all great and healthy until you realize no, that doesn’t mean you can eat a whole batch and skip the gym. Darn it. BlondeSilverLining- Definitely let us know if you make them and how they turn out! ANG- The swirls look so fancy, but they’re super easy! Maria- Perfect for the holidays…and very delicious. Mygoodhouse- If you make them, be sure to add the amount of peppermint extract I specified or else they won’t be nearly pepperminty enough for you! Maria- Let us know if you do! Apples and Butter- I just stumbled upon it and am so happy I did. CookiePie- Def. the perfect holiday treat. You could even make them for different holidays- orange for Halloween? Red and blue for the 4th? Kevin- It’s one of my favorite combos in the world. SO good! Oooh, I can’t wait. I usually don’t like cheesecake, but there’s no way I can’t try this. I just bought that issue of Cooking Light and tore that exact page out! To make this weekend! Wow these brownies look superdelicious and moist. Live the colours too. I love the color of these brownies! I bet that they were great!